Al Katz, Founder of The Next Level, LLC and author of A Journey with Mac - Rediscovering the Fundamentals of Business, is a founding father of the Business Coaching industry, with over 600 customers spanning more than 20 years. These companies run the gamut of the business world and include retail, wholesale, distribution and manufacturing plus professional practices and civic and educational organizations. From his years as President and C.O.O. of a major retailing giant, to his "second career" as a Business Coach, Al has encountered (and successfully resolved) virtually every type of challenge imaginable. In other words, your issues will not be unfamiliar and you've come to the right place for assistance. Al understands that no two companies are alike and he treats each company and owner as an individual, with a customized program designed for you alone. The foundation of this philosophy comes from THE PROCESS™, a proprietary system designed to enhance your ability to find solutions from within, utilizing existing tools that you didn't realize you possessed. As you literally watch positive change happen before your eyes, you'll wonder why you waited this long to seek outside assistance. Al is an expert at facilitating change and you'll know that the moment you meet him. What you will learn within this website is that you are not alone. Thousands of businesses, just like yours, face the same challenges. The difference is how you seek assistance with these challenges and make the necessary adjustments. Oftentimes the solutions are right in front of you. 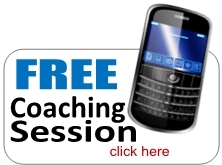 Business Coach Al Katz will show you how to maximize results in minimal time. 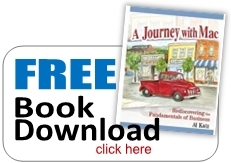 Take the first step by downloading a free copy of Al's newest book A Journey with Mac - Rediscovering the Fundamentals of Business. There is no obligation and you will now possess an invaluable resource. And call The Next Level hotline to schedule a free consultation with Al himself that can give you the peace of mind all business owners would like to achieve. "The Next Level has honestly taken my business to "the next level". Al's ability to quickly analyze my current business model, introduce sound business practices , and develop new revenue sources has reinvented my business. I am so rejuvenated about the planned growth of our operations. Al's uncanny ability to provide the necessary support to business owners is essential to "making magic happen"! He has "that touch" that provides me with confidence, ease, and a renewed passion for growing the profit of my business in a systematic way. Thank you Al Katz." I wanted to give you some feedback on 317 King Shooz. The sales have definitely improved which is great!!! I thank you for your help and wanted you to know how well your recommended changes have turned things around!